The last flu season was the most deadly in decades with more than 80,000 deaths, including 185 pediatric cases. The US Centers for Disease Control and Prevention report that at least 11 states and the territory of Guam are experiencing widespread flu cases, and nearly every US state is reporting some sort of flu activity. 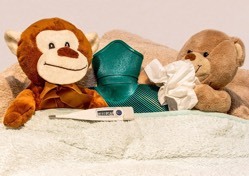 Flu symptoms can include fever, cough, sore throat, runny or stuffy nose, muscle or body aches, headaches, and fatigue. Some people even experience vomiting and diarrhea, but this is more common in children than adults. When symptoms become severe or cause worse conditions like pneumonia, then the flu can become life-threatening, especially for older adults, younger children, and people with other serious health conditions. Nine states saw rising flu activity: Alabama, Colorado, Georgia, Kentucky, Louisiana, Maryland, New Jersey, New Mexico, and South Carolina. New York City also saw higher flu activity. Influenza-A viruses have been dominating the US since the beginning of October, and Influenza-B viruses are circulating as well. So far at least 11 children have died from the flu this season. The CDC says parents should seek emergency care for children who experience warning signs like trouble breathing, bluish skin color, not drinking enough fluids, not waking up or not interacting, fever with a rash, being so irritable that the child does not want to be held, or a sudden return of flu-like symptoms after the child seemed to be improving.